I'm Not Skinny: Argyle nail art and nail art brush kits. I've been really slacking on my nail art game as of late. Apparently I'm not skinny or creative this week! I've had several nails break and they just feel so short to me that I haven't been inspired to much other than paint them solid boring colors. Sorry, solid colors...you're kind of boring. Since I'm trapped at home with a bum knee today I got to perusing nail art on the interwebs and I ran across a page called 23 creative nails tutorials then I immediately fell in love and had to recreate this argyle nail look that I saw on there. It gave me an excuse to use my China Glaze For Audrey, which face it...is everyone's favorite. Looking for a deal on some great nail art brushes? Got you covered! Amazon has great kits at great prices. Get on it! and happy nail art! very cute. I wish I could do nails like that. The argyle design is really cute. Your nails look great. I wish I had that kind of talent to do mine. I am not sure I could even with the roper tools! Good job! That is so cute. I get my nails done at the salon and I am always printing pictures off of Pinterest to bring in to them. Oh my gosh.. 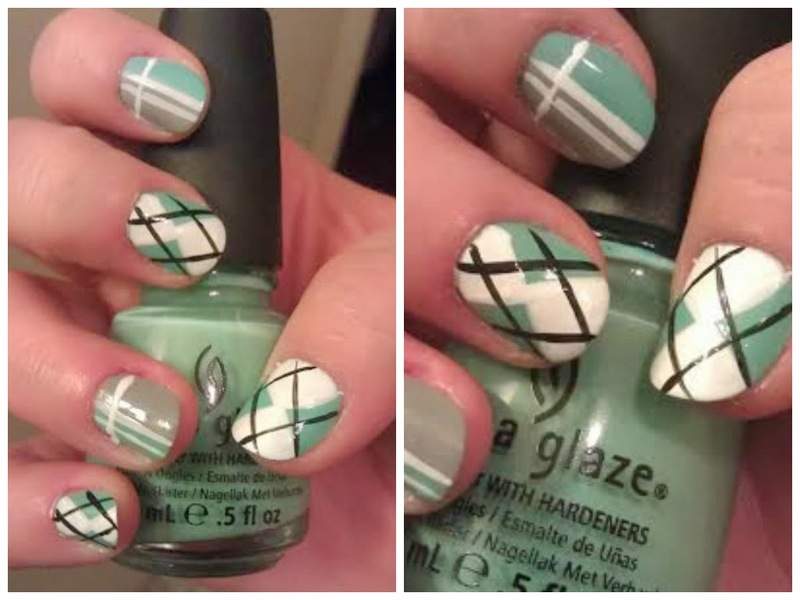 I love the Argyle nail art. I would have never thought to do that. They have so many designs now days. Wow, I wish I was even half that good at doing my own nails. They look amazing. Love the look! I really like that argyle look, and it goes great with the cold weather. I must also say that the teal color is amazing. Oh wow, that is really cool! I wish I had the patience to try these. Plus carpal tunnel kind of has me randomly tossing things, lol. Oh my gosh! Those nails are awesome!! Not sure I would have the patience to do that!! May have to show my nail tech!! These are so cute. I have no clue how people paint their own nails though. I love my nails done up nice and these would be awesome! Nice job. My daughter is really into doing designs on her nails. Thanks for sharing! Oh I love this. I love doing my nails but need good brushes! Tht's a very nice design!